Paintless Dent Removal (PDR) is a highly skilled technique of removing minor dents from the body of the car. A range of damage can be repaired using PDR, such as car park door knocks, minor creases, and hail or gumnut damage. PDR avoids the hassles of using a panel beater which allows for huge reductions in both cost and time. 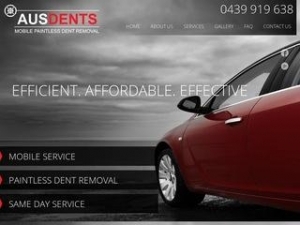 Ausdents is an industry leader in Paintless Dent Removal. Servicing the Perth Metro and parts of the South West Region. For those who want their car looking brand new, Ausdents' mobile service is perfect for removing dents quickly and cost-effectively.